If you are someone who watches Kiki’s Delivery Service and laments that there are not enough comic books out there that make you feel that warmth, then boy, oh boy do I have the series for you! Luke Pearson’s Hilda, a series of stories about a young girl and her fantastical adventures in a world where magic and interesting critters are around every corner, is pure joy. Not only is each narrative well-crafted, but the art, my gosh, the art! It’s spry and exciting and enchanting and feels like you’re seeing something with heft behind every line. Each and every one is a magical reading experience. Start at the beginning and take your time. I know that I am probably not meant to put comic strips on this list about comic books, but Tove Jansson knows my heart, and my heart is the Moomins, a family of well-meaning, kind and very human trolls who go about life as you might expect, dealing with everything from leaky roofs to stormy nights in a way that entertains and enchants. Moomin is deeply philosophical in a similar way that Peanuts and Hayao Miyazaki’s films are; they refuse to talk down to anyone reading them, and couch profundity in simplicity. Just like life! Also, Tove Jansson was a queer woman, a fact that profoundly moved me in adulthood. Kozue Amano’s Aria is the manga version of sitting by a creek on a quiet fall morning. I value a kind of gentle kindness in graphic storytelling—and Aria, a story about a young gondolier learning her trade in a re-creation of Venice on Mars (this makes sense in context, I promise)—has that in spades. Will you accompany Akari and her friends to a grand, decaying mansion that has been converted into an impossibly beautiful hot spring? Will you celebrate the arrival of the chill of winter by viewing the coming of snow bugs? Will you help the older postman deliver his letters? This is the extent of the conflict in Aria, and, frankly, is the platonic ideal of a comic for me. You think you know what slice of life is, but until you read Aria, you’re still moving wayyyy too fast, man. What is there to say about Charles Schulz’s Peanuts that hasn’t already been said by thousands of people more qualified than myself? Peanuts is the origin of my comics DNA, which perhaps explains a lot about the work that I love and that I make. Peanuts depicts a thoughtful world, unafraid of depicting the world’s unkindness and its capacity to teach us empathy and make us laugh. It is the masterpiece of one man over 50 years, an astounding amount of time for a craftsman to remain at his craft, and somehow discover new facets and nuances of the human experience even as that time wound to a close. I used to cut out Peanuts from Sunday strips and put them in a giant Tupperware under my bed, and then fan them out around me when I was alone, delighted at spending an afternoon with friends. Is there anything that has made me laugh out loud with the frequency and consistency of Kate Beaton’s vast library of work? Once upon a time she was drawing stick figures on LiveJournal and still reducing me to chuckling tears. So much revolutionary cartooning in the last decade and a half has gotten its start on the web, and we are richer for it. Kate’s skill in both her cartooning and her writing is extraordinarily expressive, clever and thoughtful, whether the subject is historical figures or superheroes. One of the craft’s finest, funniest voices. Once I discovered Blue Monday in 2000, I quickly became a devotee of a certain kind of American indie comic book, and Hopeless Savages was at the top of the bill. Imagine the filthiest English punks of your imagination, happily married and engaging in adventures with their teenage-to-adult children. It’s a little subversive, a little queer and all love. Not only that, but writer and creator Jen Van Meter incubated a litany of future comic book superstars on art duties over the years, including Bryan Lee O’Malley, Sophie Campbell and Christine Norrie. Lucy Knisley is an extraordinary cartoonist and storyteller, and no one does the autobiographical personal essay in comic form quite like she does. I love, desperately, her first published work, a journey through Paris with her mother called French Milk, but An Age of License left me hollowed out, cut to my core, crying in a San Diego coffee shop at 7 AM during SDCC 2014. As an intense devotee of food comics, her beautiful ode to eating, Relish, also deserves a mention here, but An Age of License’s immediacy and maturity have stayed with me. A reminder that the twists of one’s life often lead us to exactly where we are meant to be. As a young queer human who desperately just wanted permission to be queer, the never-ending push-pull of the love between Francine and Katchoo desperately frustrated me. “If someone like Katchoo loved me,” I used to think, “then it would be okay that I was gay…I don’t understand why Francine doesn’t see that!” Such is the emotional power of this 90-issue epic romance, a drama with so many twists it’s a wonder that HBO hasn’t called on creator Terry Moore to adapt it for intensely compelling television. Lucky for us, it’s forever enshrined on the page to get lost in again and again. I stumbled onto Blue Monday thanks to a feature in Animerica Magazine (GOD, REMEMBER MAGAZINES?!) and it’s not an overreaction to say that it changed everything for me. Imagine if all the best parts of a John Hughes movie were mashed up with the gang at Empire Records, all drawn in a manga-influenced style that was distinctly creator Chynna Clugston’s own, and you get Blue Monday, aka the blueprint for my teen years. A fun side note! Chynna’s margin shout-outs to then-Oni Editor in Chief Jamie Rich were what made me hip to the fact that comic book editing was a real job! AND LOOK AT ME NOW. 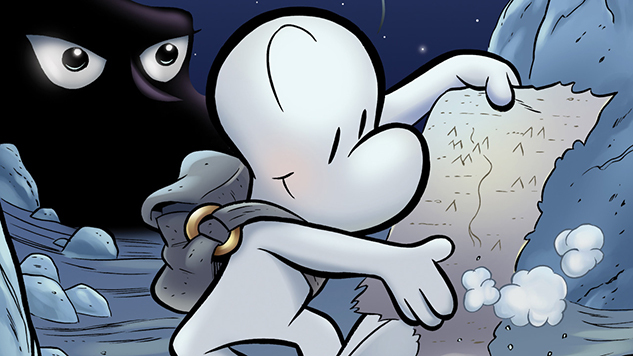 If you ask me why I’m here, what curious alchemy put me on my present path, the true transformation from some kid who read a lot of Calvin and Hobbes and FoxTrot to future comics nut would be the moment Jeff Smith’s Bone appeared as a temporary feature in Disney Adventures magazine. It is, perhaps, the finest kids’ comic ever published, but beyond that, it is one of the masterpieces of our medium, a beautifully crafted graphic work kindly written, a story told with skill and grace and joy. You have probably read it, and if you haven’t, it’s time to stop telling yourself it’s not for you and savor the kind of story that gives one hope in love and in goodness, a hope sorely needed now, as ever. Last year, Paste’s writers and editors did some soul searching and paid homage to the comics that inspired our career-long devotion to all things sequential art. As we approach Thanksgiving this Thursday, we asked a handful of professionals to divulge their favorite comics of all time. Today, BOOM! Studios editor and writer Shannon Watters counts down an eclectic mix of classic strips, scrappy indie watermarks and all-ages gems. 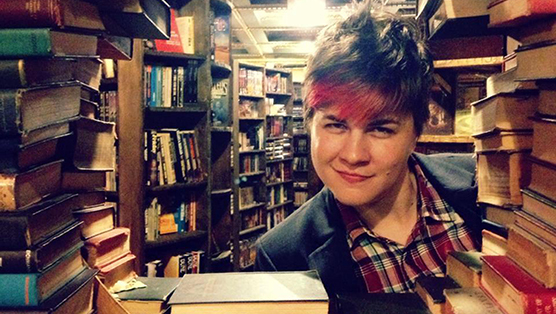 Watters is the co-creator and co-writer of Lumberjanes, an enchantingly funny YA title that’s continually broken new ground with a LGBTQ-friendly cast, time travel and charming raccoons. Watters also oversees the editorial branches of the kid-friendly KaBOOM! imprint and the experimental BOOM! Box, where titles ranging from John Allison and Lissa Treiman’s Giant Days to James Tynion and Rian Sygh’s The Backstagers have released. Check back tomorrow when another creator will reveal their favorite comics of all time.